On Wednesday October 21st, 2015 Deputy Surratt and his K-9 partner Hyco gave chase on carjacking suspects. One suspect turned and began firing gunshots at the Deputies and K-9 Hyco. Hyco was determined to not let this continue and went full steam to stop this violent suspect, and was struck by gunfire while doing so. Deputy Surratt grabbed his injured partner and rushed to the emergency vet. Deputy K-9 Hyco succumbed to a gunshot wound and was pronounced a short time after arriving at the hospital. 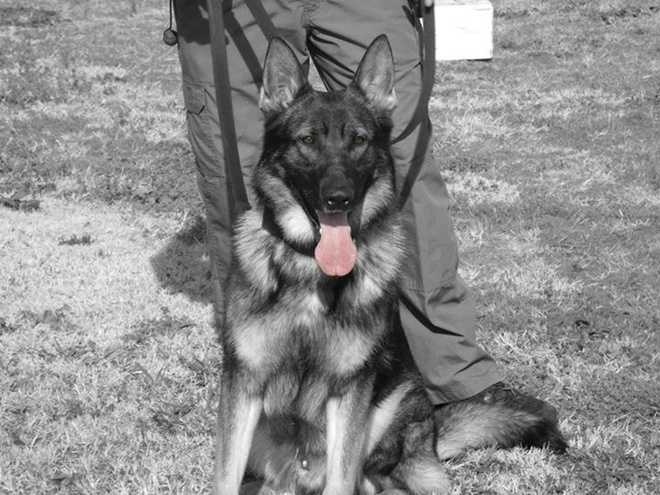 With Hyco’s dedication and loyalty to his work, K9 Hyco was one half of the best-trained K9 team the ACSO had. In 2012, K-9 Hyco and Deputy Surratt, (along with another ACSO K-9), completed the American Police Canine Association’s level 3 certification which recognized them as among the top certified units in the country. The certification qualified K9 Hyco and his partner for tracking, narcotics detection, building searches, article searches, aggression control and obedience. Deputy Surratt and K9 Hyco were awarded the 2012 APCA President’s Award for Professional Excellence. In the days following Hyco’s passing, the Anderson area community rallied with stickers and bracelets honoring K-9 Hyco. From there an idea to hold a 5K Run in Hyco’s honor was born. The 1st Annual Hyco Memorial 5K planned October 22nd 2016 almost a year to the day of Hyco’s passing. As the planning process developed and support was so strong a decision was made to apply to become an official charity with 501c3 status. The idea was to honor Hyco and continue his work to help protect our community and other K-9s through the Hyco K-9 Fund. All proceeds from this run went into the Hyco K-9 Fund. The fund was set up to assist the Anderson County Sheriff’s K-9 Unit with costs not currently covered by their budget. This included things such as on-going training and equipment. The purpose of K-9 Unit is to provide the citizens with trained police service dogs to help locate illegal narcotics, apprehend fleeing felons, detect explosive devices and find lost/missing persons. To accomplish this units often utilize several breeds of police service dogs such as blood hounds, German Shepherds, Dutch Shepherds Belgium Malinois and Labrador Retrievers, and more. These dogs have proven to be an asset to their departments and the communities. Each dog must be trained and certified in its particular duties. As officers must be continuously trained in law enforcement, so must police dogs. All of the training is conducted by the unit’s handlers and train weekly. Many K-9 Units have little or no budget. This makes it difficult to have updated training, protection gear, basic training gear and other supplies needed to make these K-9 units safe and the best they can be. Our goal is to assist these units, when possible, to acquire what is needed as they see fit.